Visions of sugar plum fairies have been dancing in the Sugar Shack founder, Suzi Tinsley's head since she was a little girl. What better way to share her love for everything sweet then to open the ultimate candy store in her home town of Menlo Park, California. 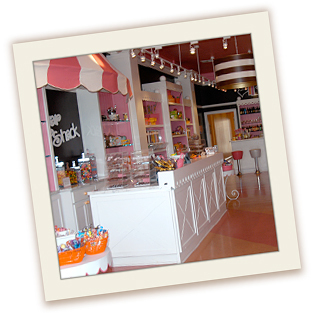 Sugar Shack is not just about offering every kind of candy imaginable. It's about the magic you feel when you step through the door. Sugar Shack's unique, custom designed interior resembles a real ginger bread house with a contemporary twist. Remember that verse: "The candy man can 'cause he sprinkles if with love and makes the world taste good"...Well, Sugar Shack is committed to making people feel good, and it's not just the candy. At the center of Sugar Shack's core values is customer service. Like the good 'ol days of full service gas stations, polite clerks and the customer always being right, Sugar Shack is built on the traditional values of honest hard work and customer service. You'll hear the staff ask you "how are you" and really wait to hear your answer! Feel free to sample something before you try it, and if we don't have the candy you're looking for, let us know and we'll order it for you! Sugar Shack was also created to inspire sweet celebrations. Every event in life is better with a little sugar sprinkled on top. From party favors to entire private parties, Sugar Shack is as much a candy store as it is a special events headquarters. The idea was a life-time in the making: a candy store with old fashioned, quality customer service, an enormous selection of sweets and an ambiance to inspire sweet celebrations.